Summer is definitely on its way and so far so good for the golf course. We experienced many rainy days in May. Though things were very wet at times, it did help some seedlings mature. Temperatures were moderate in May, which is a plus at this time of the year, but I feel that will all change very soon. With that being said we’re trying to best prepare the course to withstand the summer stresses I am expecting. Below is a picture of a typical par 3 tee after an average day of play. Though divot buckets are available on all par 3 tees I only see maybe 5 out of the 25 divots I counted in the picture filled with sand. 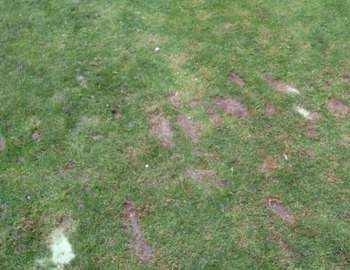 The maintenance crew regularly seeds and fills divots, but that is not enough. We definitely need the help of our guests to take a moment after they hit to fill their divots and fix their ball marks on the greens as they’re playing. Even if the divot or ball mark isn’t yours any help you can provide goes a long way in keeping the tees and greens in good playing conditions throughout the summer months. My experience has been that if one player in a group does these two things then the other players will follow the good example being set. We can’t do it alone, so let’s all work together and help create the best playing conditions possible.